What stands out most about Fletcher? Did you have a favorite teacher or mentor? Yes! I still stay in touch with Nicole McConnell (Fletcher Spanish teacher) and Molly Gartlan (Fletcher Science teacher). Mrs. McConnell inspired the want or lust for travel in me. Mrs. Gartlan has always been so supportive. Former Fletcher faculty member, Dr. (Debbie) Holzberg also challenged me in ways no one else has. She pushed me to advocate for myself like I never had before. What stands out most is that my teachers at Fletcher really took the time to listen to me and understand my struggles. They were always willing to work with me to figure out how I could best learn. One project that really stood out was The Global Impact Conference group project on Ethiopia. This was a deep look into the issues facing other countries and was very eye opening to me. Another project that inspired me was our seventh-grade project called Traveling Through Asia. This was an intensive creative writing assignment that resulted in a bound book. I chose to research India, Thailand and Taiwan. We had to make up a character who traveled to these different countries. I had to learn so much about these countries in order to make my story and the experiences of my character realistic. I learned about the food, the cultures, what they wore, etc. This exploration of India is what inspired me to one day travel there. What was your educational journey after Fletcher? After graduating from Fletcher in 2013, I attended Appalachian State University as a Business major for a year and a half. However, I soon realized that a Business degree was not for me, and I moved to India. It was there that I made a key connection while working at a daycare. I met an eight-year-old with cerebral palsy, Sarvari. She inspired me to focus my attention on children with disabilities. 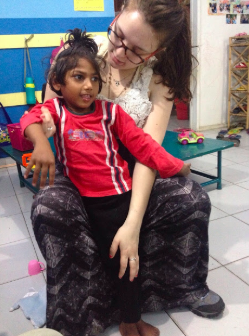 Through my work with this child, I realized the drastic differences in the quality of care, facilities, and treatments available in India compared to the United States. 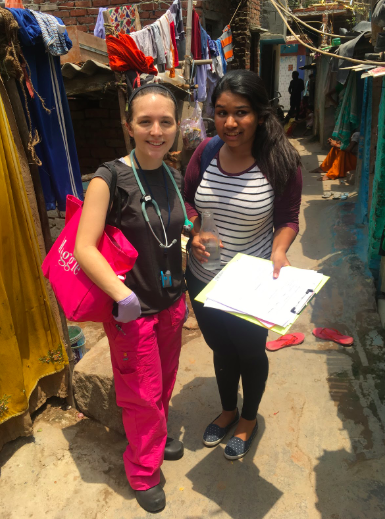 I decided to return to school in the United States for a nursing degree and traveled back to India each summer to work with the New Delhi Children’s Hospital and Research Center (NDCHRC). It was my goal to bring new tools and treatment plans that are available for children with disabilities in the United States to India. I am currently a senior Nursing Student and after graduating in May 2019, I will return to my work in India. I will be working at the NDCHRC as a Nurse while overseeing treatment and operations. I will help maintain both quality of treatment and increased accessibility and awareness for children with disabilities. While attending nursing school at UNCC, I’ve been leading personal fundraisers in support of the NDCHRC. After raising more than $3,000 in 2018, which allowed me to provide equipment needed for children with disabilities, I founded a nonprofit called The ALMA Project in 2019 to fundraise for the NDCHRC. The goal of this project is to create promotional activities and fundraisers to provide financial support for the operation of the Early Intervention Center - an initiative by the NDCHRC. Long term, I hope to supply sufficient funding to help NDCHRC open the first high-quality public children’s specialty hospital in New Delhi, India and to continue to support their efforts indefinitely as they continue to expand their efforts across India and into other low-resource countries. I recently received a Fulbright Research Grant and will be completing research as a Fulbright Scholar for a minimum of a year in New Delhi. I will be conducting interviews and a longitudinal study of families that come into the clinic in order to understand how they navigate the current Indian healthcare system with a child newly diagnosed with a disability. I will continue to lead fundraisers through The ALMA Project during this time -- both in the U.S. [through collaboration with networks formed at UNCC] and online. How did your education at Fletcher prepare you for life after graduating? Did your experience at Fletcher influence your career path? I will never forget how the teachers at Fletcher always took the time to really work with me through my struggles. They taught me how I learn best and skills in self-advocacy that have stayed with me since graduating. The closeness that I felt -- being able to feel that teachers really had my back, genuinely cared about me and still do -- means so much to me even to this day. Learn more about Johnson’s non-profit The ALMA Project and the New Delhi Children’s Hospital and Research Center (NDCHRC). You may also keep up with Maggie and The ALMA Project on Facebook.